Neste MY Renewable Diesel™ produced from 100% renewable raw materials can help its users reduce greenhouse gas emissions by up to 90% over the lifecycle of the fuel compared to conventional fossil diesel. Replacing fossil fuels with Neste's renewable fuels reduced global climate emissions altogether by a staggering 7.9 million metric tons in 2018. The figure equals removal of 3 million passenger cars from the roads for a full year - more than the amount of cars in the city of London, UK, for example. Neste MY Renewable Diesel and crude oil based diesel differ both in the total amount of emissions generated throughout their life cycles, as well as in how the emissions are distributed between the different phases of their life cycles. In addition to significant carbon emission reduction potential, Neste MY Renewable Diesel offers a cost-effective solution for reducing traffic-related local emissions and improving local air quality in urban areas. Its use can improve air quality in cities making it an excellent alternative for powering city buses, for example. Local emissions can, of course, be reduced effectively also by investing in a new fleet, for example, in vehicles with electric engines or the most modern diesel engines. However, if such investment is not an option and there is a need to reduce harmful emissions immediately, Neste MY Renewable Diesel offers a drop-in solution that the existing vehicles can use right away. 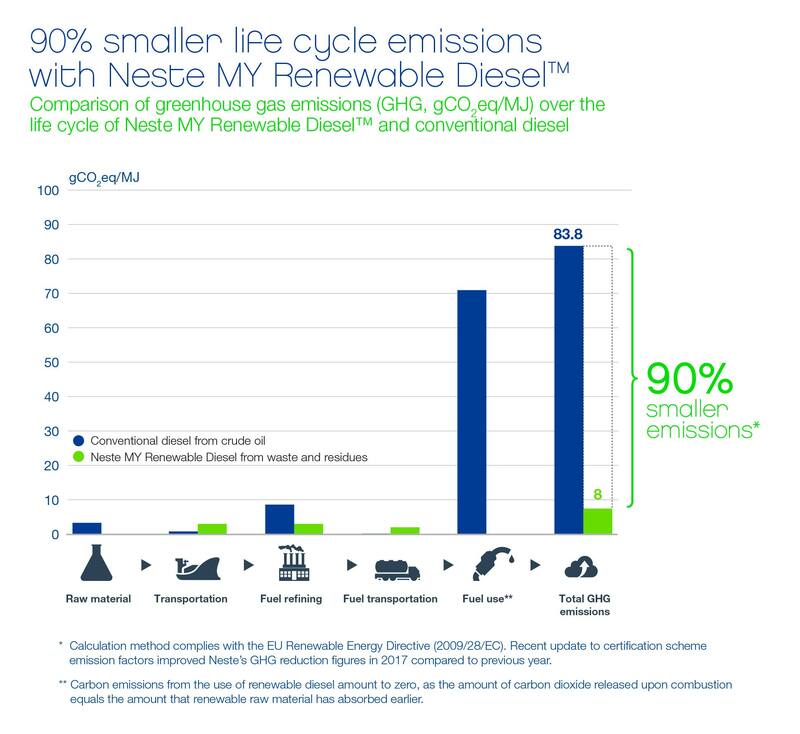 The older and less developed the engines, the clearer the emission-cutting benefits from Neste MY Renewable Diesel are. *) These average emission reduction figures are derived from studies on Neste MY Renewable Diesel and HVO fuels when 100% Neste MY Renewable Diesel has been used as the fuel. Vehicle emissions have been compared to those of conventional sulfur-free diesel. Findings are published in over 40 scientific publications. Optimizing engine specifically for renewable diesel reduces fuel consumption and emissions even further. Neste is cooperating with leading Finnish companies in the development of a new Carbon Handprint tool.